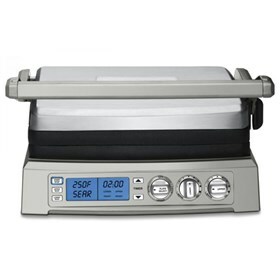 The Cuisinart Griddler is an ideal appliance that features reversible plates, variable temperature settings, superior searing capability, and a top cover that is fully adjustable. It can be used as a griddler, contact grill, panini press or extra-large double open grill and cooking is perfectly customized and precise every time. The appliance offers a full 240 square inches of cooking surface to get even the big jobs done. The Reversible Griddler has many exciting features for users of all types. You can extend the lifetime of your Reversible Griddler with the purchase of a FactoryOutletStore Factory Protection Plan. The Reversible Griddler is sold as a Brand New Unopened Item.